Our Broomfield, Colorado office has recently been contacted for a new, ground up commercial building, in the surrounding area of Denver. The site is about a one-acre parcel of land that is relatively flat and lies adjacent to a secondary highway, providing vehicular accessibility and visibility, to the new building. Future growth and building expansion will be delineated and accommodated for in our master planning design considerations. This is reflected in the building footprint location (NW corner of the site), as well as with existing and future parking lot layout in our site planning. The elevation of 5,120 feet and plentiful resource of sunshine will be utilized to benefit the owner from photovoltaic solar energy. Thus the South facing slope is designed so that solar panels lay flat on the roof, integrating with the architectural form and assisting this company with provisions for their electrical requirements. 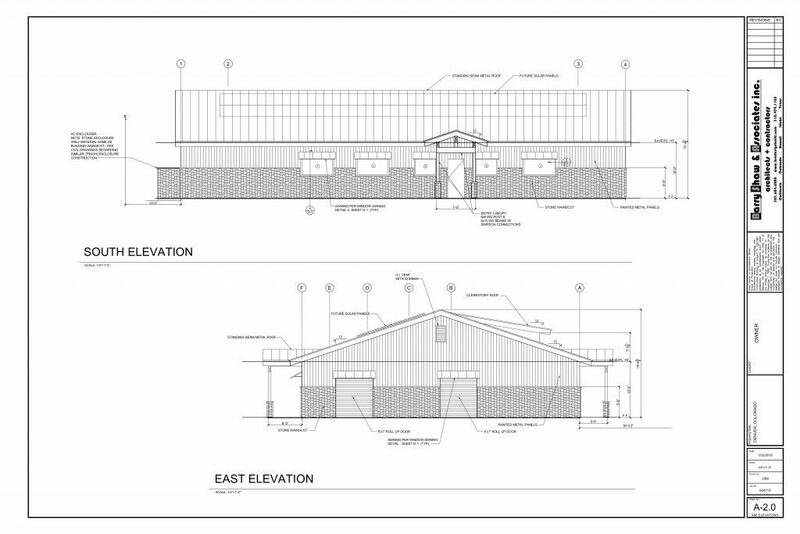 Further reduction in electrical lighting costs, will be attained from natural light received from the clerestory windows on the top roof, as well as skylights placed over the warehouse storage area. Employees in this environment will be provided with beautiful views of the Rocky Mountains, crystal blue skies and vibrant Winter sunsets, from their break time ‘activity area’, ensuring rejuvenation during their daily work time. Placement of extra wide and extra high exterior (future interior access from addition/building expansion) roll-up doors (seen on right side of building), accommodate receiving and distribution requirements for this new start-up Bio-Tech R & D Company. The structure will be composed of a concrete slab on grade, masonry and steel stud walls, along with prefabricated steel frames in the shape of a gable, that forms the sloped roof. Working with this type of cross section allows for open truss volume ceilings on the interior, that’s highlighted with round colored ductwork streaming through this structure in a dynamic and functional fashion. Our team of Consultants (Civil Engineer, Land Surveyor, Soils Engineer, Structural Engineer, Energy Engineer, etc.) are being phased in as needed, with our Design-Build system. This project is being synced to work with the Season’s in this part of the country, so that cost and schedule are optimized for the Owner. Thus design and engineering during the Winter months; building department processing in the Spring; and construction during Summer and Fall. Our one-stop all-inclusive package of architecture and general contracting services, along with (10) licenses in multiple States, provides Client’s with a unique resource, for light commercial and residential projects. Let us know what you may have in mind, for your project?